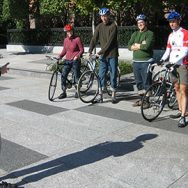 This class is for adults and mature teens ages 16+ who want to learn to ride a bicycle. With our safe, easy, effective method, Learn to Ride students learn how to balance, pedal, start, stop, and steer a bike, as well as adjust a helmet for proper fit. Most people learn to ride in one session, but even if they don’t, they’ll leave equipped with an easy, low-stress way to teach themselves. It doesn’t matter if you’ve never sat on a bike or just not in years, we’ll get you rolling! The class will run with a minimum of 5 students. Enrollment is limited to 10 participants. Bikes and helmets are provided upon request. Be sure to dress appropriately: Wear long pants. Do not wear loose or flowing clothing. Be sure to bring water and a snack with you. Need a bike or a helmet for this class? Let us know so we can prepare a bike for you or if you will need to borrow one of our helmets donated by the Breakstone, White & Gluck law firm. Send us an email at info@bikemilton.org!